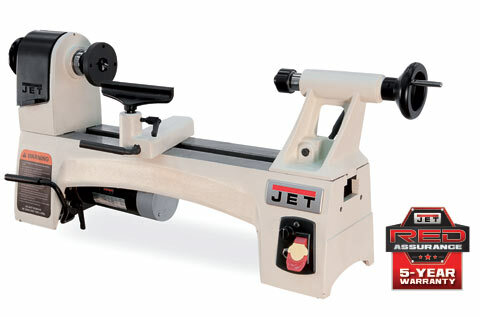 The JET 1015 is an ideal choice for the novice woodturner looking for an affordable, user-friendly first lathe, as well as the advanced enthusiast or professional who wants to add a full-featured mini-lathe to the shop. This sturdy, smooth-running 15” mini-lathe has the power, precision and versatility to turn out any number of projects. Standard Equipment includes: 6" Tool Rest, 3" Faceplate, Spur Center, Live Center, Knock-out Rod, Handwheel, 24-Position Indexing and Wrench and Manual. An additional $35 will be added to regular Shipping & Handling for the lathe, $15 for the bed extension, $20 for the stand, and $15 for the stand extension. This item is shipped from the manufacturer by truck. Air shipping and international shipping are not available for this item. Ships to the 48 contiguous states only. It is not available for pick up at our facility.